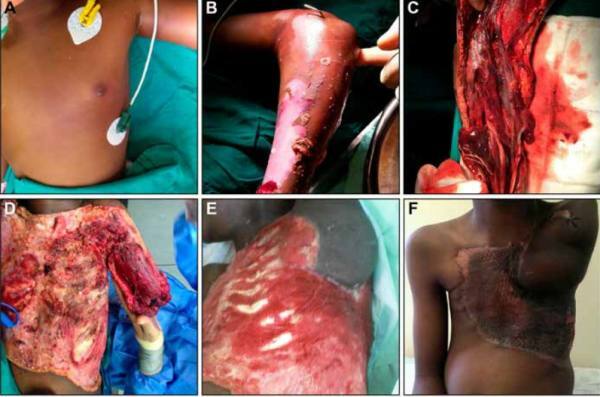 This case report published in the South African Orthopaedic Journal highlights the association of necrotising fasciitis in a child with an open distal radius fracture and a supracondylar fracture. A 10-year-old boy was admitted 24 hours after falling from a tree with a Gustilo and Anderson grade II distal radius fracture and a Gartland grade III supracondylar humerus fracture. The wound was debrided and the fractures reduced and stabilised with Kirschner wires. Within 48 hours of admission he developed a necrotising fasciitis that extended onto the chest and eventually resulted in a shoulder disarticulation. The tissue defects were covered with flaps and skin grafts and the patient was discharged home. • This case highlights the importance of having an early and high index of suspicion for necrotising fasciitis in a child with an open contaminated fracture and delay to both antibacterial chemotherapy and surgical debridement.